Broken link issues can cripple a website and company revenue. Therefore it’s imperative to use a broken link checker on a consistent basis in order to find issues that can drastically reduce sales, traffic and potentially result in bad rankings with the search engines. There are a lot of broken link checker software tools on the market these days, many of which are free but rudimentary tools. Tools such as Xenu Link Sleuth , LinkChecker and the W3.org validator are available, just to name a few. A webmaster can get away with using free tools in order to find broken links for small sites, but it may not be possible to find all of the problems which exist with these links, such as enormous load time. And with large sites, free tools are usually worthless. Usually, these free tools only provide basic information and reporting. With the powerful web analysis tool Forecheck, you can use it as a broken link checker and more for sites of any size, even large corporate sites that have 1 million links! 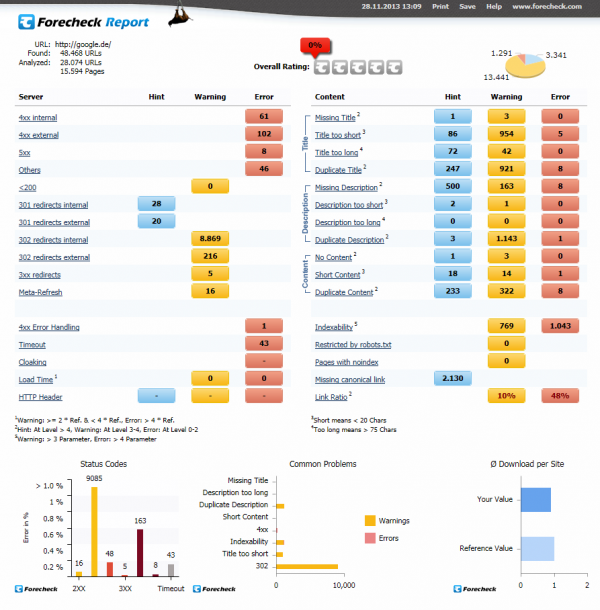 Forecheck provides minutely detailed information along with hundreds of features. Check for broken links as well as Server Status codes, 404s, 401s, 301s, 302s, 303s, 5xx, 2xx and get detailed information on where these are located, what links are connected to them, which pages are affected and detailed but easy to read reporting that will pinpoint issues and errors. 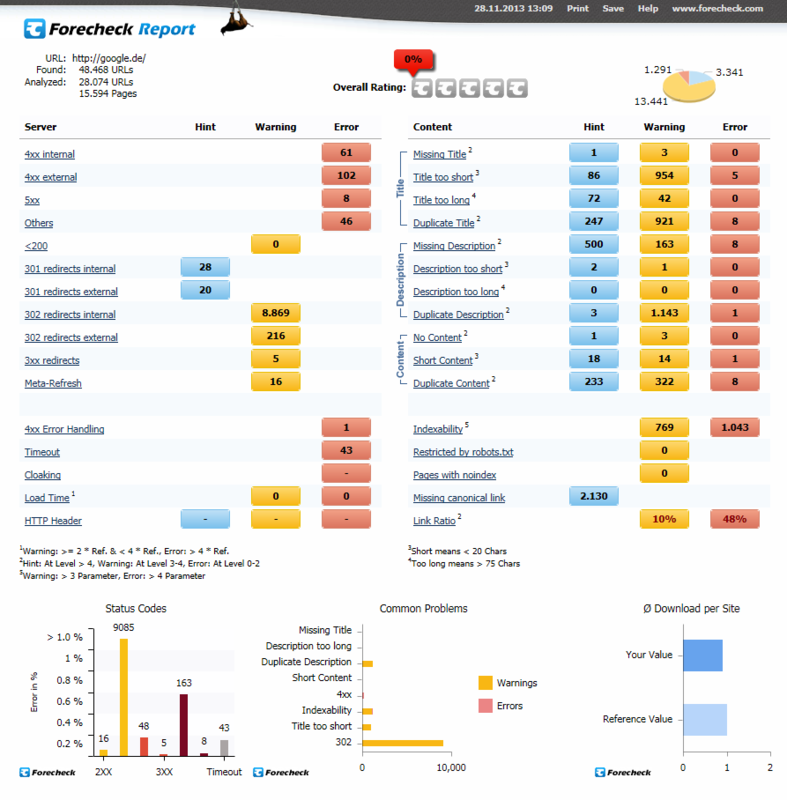 Best of all, you will save a massive amount of time because Forecheck runs amazingly fast and provides all of the detailed information needed. Dead links are annoying, but they can also create havoc for a site and lose existing or potential customers. As we all know, these days someone will make a judgment on a website in seconds. When someone starts experiencing usability issues, it’s likely the user will fly the coup and may or may not return in the future. Broken links can lead to frustration, but they can also hamper or block someone from shopping cart and buying transactions. And to top if off, not only can a site lose clients and sales, a site can also experience negative rankings by Google and the other search engines. Broken links can be difficult to find (use the search functions in Forecheck, for example, those corresponding to Soft 404 errors). The delivered pages are counted as duplicate content, which is generally detrimental. Visitors get a page that they do not expect (Error Page) and you may not know how often this problem occurs. For this reason, Forecheck always checks the Error Handling. With Forecheck, be prepared for deep analysis. 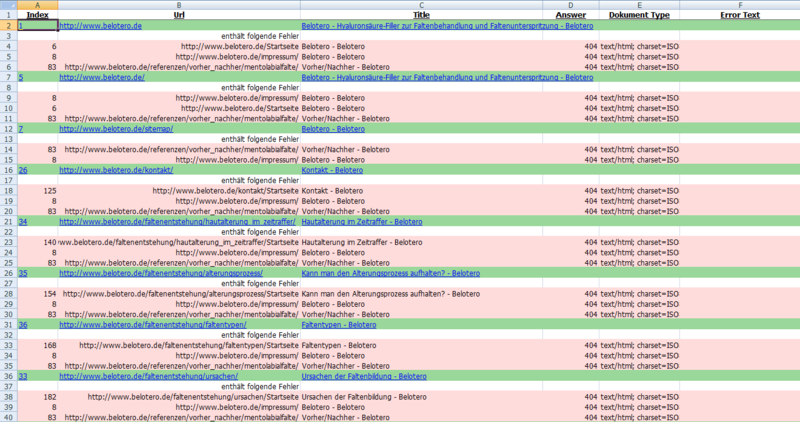 As a broken links checker, it will fully analyze all URLs available along with errors, warnings and reports. 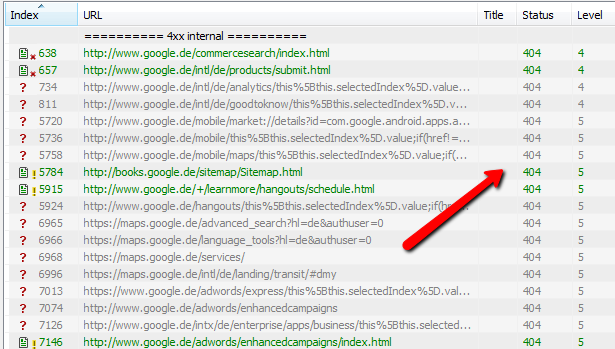 The Links tab in Analysis mode provides a full list of the URLs along with “Links to” and “Links from” options. Check for broken links and easily correct them with the reporting features provided. Forecheck isn’t only a broken link finder, rather it’s a tool which analyzes practically every aspect of a website, finding and dissecting all URLs along with the content and issues which might appear. Load time, duplicate content, User Errors, Meta information and so much more is offered. Depending on the selected type of the URL, you can see all the inbound links on the left; to the right, all outgoing links. If you choose an external URL in the middle list, you will see only URLs in the left list and no outgoing links in the right list. The external URL is already an outgoing link for all URLs in the left list. If you choose a redirect in the middle list, you will see the target of that redirect in the right list and all URLs in the left list that contain this redirect. 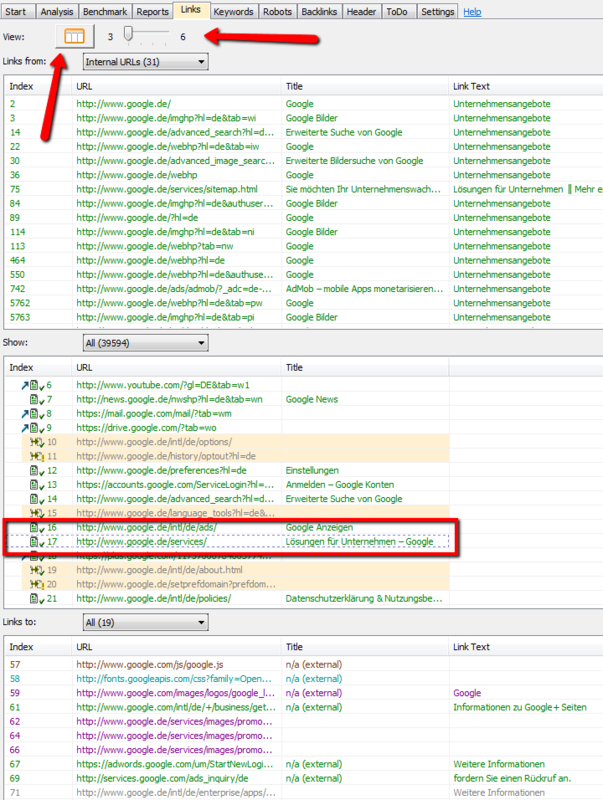 In the case of interlinked redirects you may also see a redirect in the left or the right list. When right clicking on the “View” Button, the lists appear in order one below the other. You can view the links, tracing them up to 4 steps backwards. The inbound links of the selected URL in the list below are always displayed in the list above. With the slider you can add up to 3 more lists above. This view is helpful for back-tracing links, which is valuable information for multiple redirects, as it is difficult to retrace such multiple redirects. As this feature and others show, another advantage of using Forecheck is that you can select specified issues and see the exact results. For example, if you want to see all Server Status Code warnings or errors, you can choose this option. However, what if you only want to find all the 404 Not Found errors so that you can check broken links of this kind and quickly make the necessary corrections? With Forecheck, just check the specified Status Code features, in this case the internal 4xx option and get the returns in seconds! And what if you need to send detailed reports to your website developers? Run reports in Forecheck based on specific options and get accurate, detailed and easy to read reports – and therefore easy to correct issues. Other broken link checker tools offer reports, but most of these are cumbersome and don’t allow for user input, selection or rearranging. Forecheck provides multiple report features, and you can export specific broken links to Excel files and rearrange as you prefer. This allows for easy methods of creating reports based on expectations and necessary use for web teams. Instead of generating hard to read HTML files or PDF files that you can’t edit, select or copy and paste, with Forecheck you can mainstream and tailor the reports. This is a great benefit where businesses must make vital changes the day before!